Zikodrive motor controllers are increasingly being used in the arcade and amusement industry. Part of the reason for this is that, like all industry, there is a move towards more efficient technologies – brushless DC and stepper motors are a good example of this. A second part is that our stock range of motors and controllers provide a huge amount of potential for innovation in the industry. Pre-programmed and custom programmable controllers enable designers to go to places that were previously not thought possible and solve challenges that may have involved complex mechanical work only a few years ago. The Zikodrive ZD10LCD is a powerful stepper motor controller with inbuilt user interface. More commonly used in the pump market it nonetheless highlights some of the possibilities available with Zikodrive controllers. Request quick programme changes to be made to this stock controller or alternatively, as us about developing your own user interface to work with one of our stock range of controllers. Watch the video for a basic demo or have a look at our Youtube channel for more video demonstrations. We understand that the arcade and amusement market is constantly innovating. Those companies that stand still risk being left behind immediately in a fast moving marketplace. That’s why we’ve developed a broad range of controllers designed to support you in your quest to innovate. From fully programmable and optimisable brushless motor controllers through to fully programmable stepper motor controllers, we can help. If you’re thinking about a new project and would like to talk to our team about the best option for your project, please don’t hesitate to give us a call on 03331237130. We’ll be very happy to help get your project moving. 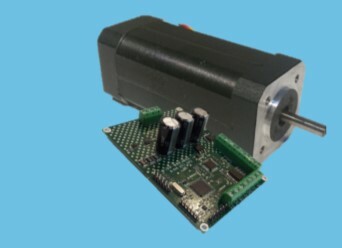 Our stepper motors and controllers provide a wealth of options for designing pushers. Whether its changes in speed, torque or fine control you need. Let us know! We're always interested in hearing about new projects or ideas and we're very happy to discuss what may or may not be possible without obligation. I've been using DC motors for years - why change now? DC motors are a hugely important part of the history of the arcade and amusement industry and in many cases still have a role to play but technology has moved forward and can offer a significant number of advantages. For example, neither stepper or brushless motors will burn out. A further point is that the control of stepper or brushless DC motors can be delivered in a much more intelligent way. We think that this will enable the industry to develop an exciting array of new games and machines. I don't have time to be fiddling about programming complex controllers so why should I bother? Once we’ve got the specification through from you and agreed what you need we will deliver this, test it with you and then (once you’re happy) we will provide all the motor controllers you need pre-programmed and ready to go. The amusement industry is famously cost sensitive - I think I'd be better off with a cheap imported controller. You might be – but you might not be. Don’t forget that we offer exceptional service, custom programming and help setting up the controller in the job you need it do. I need a customised user interface (GUI) - can I do this with Zikodrive Motor Controllers? Yes you can! Just let us know the details of what you need and we’ll do the rest.